I usually opt for the half marathon at the April Fools race but this year I’ve been embracing shorter distances and Saturday races during Healthy Kids Running Series season. Additionally, my 14 year old son requested to join me this year so I figured the 7k distance would be the best bet. There’s also a 11k option on Saturday. The half marathon runs on Sunday. For an additional $10 per packet, there was race morning packet pickup. To save myself time and travel expenses (it basically evens out), we did morning packet pickup. Parking was only $5 with a Resorts Casino card, I picked one up a few weeks back when I spent the day in AC. Lucas and I met up with Chrissy and were quickly able to get our bibs and race shirts. Ladies got pink, men got blue. A huge draw for the Atlantic City races is that without fail, I always see a ton of friends there. It’s a quick hour drive on the expressway from my house, which means that I can spend the night at home and just wake a bit early and hop in the car. Run856 Turtles – I love this group of local runners! The weather was rainy but not too cold, so it was actually comfortable to run in. This was the longest distance for my son so we chose to do 1:1 intervals to keep a consistent pace. After the Star Spangled Banner and a countdown, the race started at 9am. The entire 7k course is on the boardwalk, which is somewhere I always enjoy running. There was a water station on the way out and back around the 2 mile mark (and the same on the return, not exactly sure of the distance). It’s always a really nice run – despite the weather. Lucas and I rocked our AfterShokz headphones so we were able to jam out to our music and still chat with each other. He’s been running track at school, where the longest distance is a mile, but we also ran a 4 mile training run recently. The 1:1 intervals helped him feel good and confident the entire time and he stuck with me at my pace for 3.35 miles – the last mile I told him to GO and away he went. Lucas’ main goal was to finish under an hour, which I assured him wouldn’t be an issue. He finished in 51 minutes while I rolled in at the 53 minute mark. The finish line has lots of snacks and goodies, which Lucas loved every moment of. He went to get snacks and I stayed at the finish to cheer in friends. What I love about this particular race, more than anything else, is that I got to run with Lucas. I was having a bit of calf pain in the days leading up to the race and there was a brief moment when I thought I might have to sit it out. Thankfully, he took it easy with me and as much as I was asking him how he was feeling and doing, he was doing the same for me. Yeah, my kid is pretty great. And so is this race. I’ll be back to Atlantic City in June for the 2nd Bungalow Beach 5 Miler. Will I see any of you there? I think I might have lost my mind. As a rule, I don’t register for summer races. I just don’t. Occasionally I’ll do a July 4th run, if the urge hits but normally I am not a fan of summer racing. AND YET… Just over a week ago I was in Atlantic City, running the Inaugural Bungalow Beach 5 Miler. The Atlantic City Marathon Series hosts spring and fall events and I love participating in them. From my very second half marathon, the Inaugural April Fools Half in 2012 to their fall 10k I’ve done my fair share of Atlantic City races. The Inaugural Bungalow Beach 5 Miler was the first summer event hosted by the race series and as soon as I heard about it, I knew that I’d be signing up. After all, the first 100 to sign up got this beach towel along with their early registration of $35 and you know I can’t pass up a deal like that! As soon as the news of this race hit Facebook, I saw that many of my local friends were registered as well (the lure of a beach towel is great with NJ folks). There was a packet pickup the day before but also the morning of the race. I opted to do packet pickup race morning, saving myself toll and parking money. I parked in the Tropicana garage (cost $10). I’m not sure if the tank option was listed when I registered because I ended up with a medium, which is what I usually get for the Atlantic City races but not if it’s a women’s cut. The tank is adorable, however it’s entirely see through and too small which is disappointing. I lost the race shirt lottery this go around. However, they had shirts and towels for sale after the race. My friend purchased a men’s shirt and since they were priced at one for $15 or two for $20, she got one for me too (thanks Chrissy!). Despite the recent sunny weather, the forecast for that morning was looking a bit on the dreary side with the potential for thunderstorms. I don’t mind running in the rain, but I didn’t know what they’d do if there was lightning. Thankfully Mother Nature was on our side this time and while it was overcast, that also meant that it wasn’t oppressively hot. Run856 group picture – I ALWAYS miss these before races so I was excited to actually be in one! Lifelong friend, Chrissy and I have done our fair share of Atlantic City running together. We do a lot of the races together and meet up to train there as well because it’s about an hour from each of us. We’d both not trained as much as we had planned for this race so we decided to stick together and just have fun. I met Katie through Instagram originally and then she told me about the Sub-30 Club, we became friend friends (are you following this?) and finally met in person at this race! She said she’d like to stick with us through this race, which was awesome! We set the interval timer at 1:1 and lined up at the start. The course was what I’ve deemed: April Fools Half, lite. It’s actually very similar to what Chrissy and I do when we are running our training runs there, which made it comfortable for us. In partnership with FACES 4 Autism, the Milton & Betty Katz JCC in Margate, NJ now offers Adaptive Swim Lessons, a specialized swim program designed to enhance the lives of children on the autism spectrum and to teach children with autism how to survive in the water. The Adaptive Swim Lesson program includes individualized lessons based on each child’s level of ability with specially trained swim instructors. Additional pool support staff are often needed to help facilitate the lesson. Your support of the Bungalow Beach Run 5 will help provide funding for the additional resources needed to enable children on the autism spectrum participation in life – saving swim lessons. Hollie (FueledbyLOLZ) heading back while we were still in mile 1! After the singing of the National Anthem, we were off for our 5 mile jaunt. We fell into our 1:1 intervals and took it easy as we headed along the boardwalk. After the hotels and casinos it becomes more residential, with homes on one side and the beach/ocean on the other. There was one portion of the race that kicked over onto the street (rather than staying on the boardwalk). I’m assuming this was for variety, it happens during the half course too. Thankfully we weren’t on the street too long because I’d rather run on the boards! There was a radio station at the turns off and on the boardwalk but otherwise it was pretty quiet. The volunteers at each water station were very enthusiastic, as always, and since it’s an out and back they are plentiful. The finish line was on the beach, making it a true BEACH RUN. It was not easy. Beach running near the water with packed down sand is not easy. Beach running on wavy sand? Brutal! When Chrissy, Katie, and I came around the corner a few choice words were said. I couldn’t help but laugh the entire time! Thankfully it was only about 100 yards until we crossed the finish line. After we crossed the finish and got our medals there were tables set up with water, Gatorade, bananas, water ice, and other goodies. We grabbed a few and headed down near the water to take a few pictures and celebrate our 5 miles. I absolutely LOVE the medal’s beach-y feel. Isn’t it awesome? To wrap the race up right, there was a party at Bungalow Beach AC, which is where runners could get their free beer. This area was really cute and we got to cheer for all of race winners as they were announced. All told, it was a great morning. Registering early helped keep the price low. I’ve used my new towel multiple times in the past week by my pool and I love all the perks that come along with running in Atlantic City. It’s always a race series that does it up right and I’m looking forward to returning for the 10k in October! No races in July (look at me sticking to the no racing in summer rule…). In August I’ve got Vacation Races Elk Double, City Fit Girls Retreat, and the Philly 10k (just kidding about me sticking to the no racing in summer rule…). I think I might need to break up with the Philadelphia half marathon race. My heart hurts to feel it and it feels weird to even say it because I always told anyone who will listen just how much I adore the Philadelphia Marathon weekend. I’m not usually one to complain but I’m bummed. Even with a PR, I’m bummed. I have a deep love for the Philadelphia Marathon which roots back to watching Victoria completing her first full in 2010. There’s been 6 straight years of being involved with the race in some shape or form. This year brought a lot of changes to the Philadelphia Marathon; I know that I can tend to be resistant to change but I tried really hard to go into it with an open mind. The train ride into the city at 5:40am. Chrissy participated in the 8k this year, which started at 10:45. She came in early with me so she could cheer for the half marathoners. The race began at 7:30. The first change that was made was that the half and full marathons, which were usually both held at the same day and time were split. Which makes sense from a business standpoint. They added the Rocky Challenge, which is for those people who wanted to run both the half and the full races. Good on you, running all the miles folks! The race weekend, once run by the City of Philadelphia, has been taken on by Philadelphia Parks and Rec (they manage the Broad Street Run as well). Communication prior to the race was a bit on the light side. People asked questions via email and Facebook, many went unanswered. I know there is a learning curve that comes along with these things but I was surprised that there wasn’t better communication, as this isn’t their first race rodeo. The change that impacted me the most though was… they changed the half marathon course. I take issue with this because I know the old course and I really loved the old course. I did not really love the new course. The old course is still run-able… as the first half of the marathon. It’s comprised of a nice mix of running through the city, through the streets near Drexel University, past the zoo, a small jaunt through Fairmount park, and finishing along the river in front of the art museum. I knew the new course would be different but I wasn’t mentally prepared for just how different. New this year is that they had shuttle buses from hotels to the start area. I didn’t utilize this because I stayed at home and took the train into the city but I’m thinking that was a benefit to those who took advantage of it. The security check points were set up through which we all slowly filtered. I appreciate the efforts to keep us safe but I don’t understand why the Philadelphia race weekend has it and something like Broad Street, which has 40,000+ runners does not. I suppose Broad Street’s start line doesn’t really lend itself well to having check points? Chrissy stared at an empty street near Love Park (currently under construction), waiting for all the runners! I was in the blue corral, AKA, the last corral. I had big plans. I’ve been consistently training and I wanted to PR in a major way. I found my pal Christina and we caught up on each other’s lives while we wanted for our corral to start. The wheelchair start was 7:25, the elites started at 7:30, and our corral toed the line at 8:03. The first mile was very congested but I was feeling great and happy to be running! I noticed there was a lot of construction within this mile, which didn’t help with the squeezed feeling. I looked for Chrissy at the spot we picked for her to cheer but missed her during the first mile. I knew we’d be coming back the street on the other side so I held out hope I would still be able to see her. No big surprised that it felt a little squished with so many people! I bobbed and weaved in the first two miles but after that I found a good spot and we all spread out. As I circled back around City Hall I knew I’d have the chance to see Chrissy and I wasn’t going to miss it. I hugged the right side of the road and found her! We blew kisses as I ran past and headed back toward the Art Museum. Miles 1-5 were fantastic! Seeing City Fit Girls around mile 4 gave me a boost like you wouldn’t believe and I’m pretty sure I lost my mind when I saw them. Running along the river was gorgeous. Boathouse Row is always beautiful and the fall foliage was in its prime. I continued with my 2:1 intervals and was exactly where I wanted to be pace-wise. 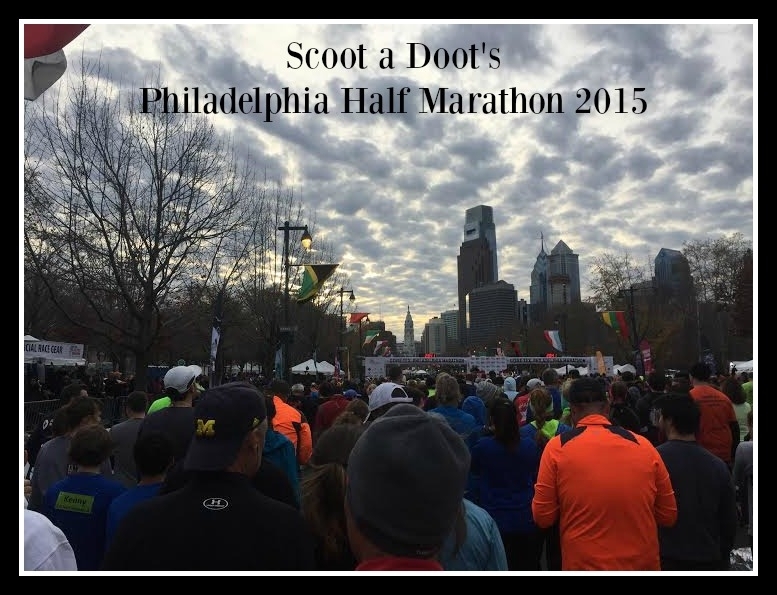 I took a GU gel at mile 5 and then heard someone in the crowd yell SCOOT A DOOT! I didn’t know it then but it was Kim, one of our buddies on Facebook and Instagram! It made me smile and I was still smiling, despite turning the corner and facing the first hill. I am no stranger to this hill; I’ve run it quite a few times in the past during races. It’s not my favorite but I was prepared for it and did the best I could. Plus there was a sweet downhill that I knew was coming ahead so I focused on cruising down. After that, it was pretty much uncharted territory for me as far as the course was concerned. There was a nice stretch of road and we all continued happily along our way. Around mile 8 we turned to go up a hill and then it felt like we never stopped going uphill. It was hill. From a race that was touted as a flat course in the past, it really wasn’t what I expected. I hustled up the hills as much as I could but I watched my time creep up on my miles and my expectation of a huge PR went down. However, I did see Dimity McDowell from Another Mother Runner during one of those horrible hills and I was so happy to see her; I thought she might be a mirage. That interaction put a pep in my step for a short amount of time, because you know, I was on a steep hill. Pretty sure you can tell EXACTLY where the hills were located, looking at this. I saw Christina a few times throughout the course and it helped to have a familiar face to look for in a sea of people. The last 3 miles were pure survival mode. I knew I wasn’t going to get the time goal I wanted, which was disheartening. That said, as I was bopping along with my music and I realized that despite not getting the time that I wanted, I was still feeling really good. My legs didn’t hurt, I was still able to do my intervals, and I was grateful for a good day of running! I finished a minute faster than my old PR (which was back at the 2014 Nike Women’s half) and while I know were it a different course, I might have gone faster, a PR IS A PR! The finish line area was sort of a mess. I got my medal and then immediately started looking around for water and food. I finally asked a few fellow runners where to find it and they pointed off to the side where a tent was set up. They had a great assortment of food for us, including the soft pretzels and chicken broth that I’ve grown accustomed to having after the race but no bags to put everything in. I found Christina again after the race and we made plans to meet up and run soon, which I’ll be holding her to (it’s in the blog post so it must happen!). I got to cheer Chrissy as she came across the 8k finish line and she felt really good! It was awesome to be there for her finish and to see many familiar faces from #run856 as they crossed the finish line. Overall, this race wasn’t what I expected and that’s odd to say, coming from someone who has done the race multiple times. Even though there was a PR that was involved, the race wasn’t what I envisioned so I guess that’s why I’m a little whomp whomp regarding this race. Maybe next year I’ll do the 8k again. Maybe I’ll get over my disappointment, train on hills, and try the half marathon again. Maybe I’ll get really crazy and run the full. I guess I’ll see where 2017 brings me! Did you race this weekend? Have you ever had a good but disappointing race? I’m feeling really conflicted with my emotions. What’s next? A local little fun run called The Light Run to look at holiday lights. My older child has agreed to do this one with me and I know we’ll be seeing a lot of friends there too. Yay! What is it about fall that makes me want to run all the races? Maybe it’s the lack of summer races (and ahem, summer training). Maybe it’s all this talk about PSL. Maybe it’s because these two handsome boys started school this week. 2nd and 6th graders in the house! I’ll tell you what it’s not. It’s not the weather. Because at the moment it is nearly 100 degrees. One zero zero. I’m making such a face right now, Mother Nature. I’m working under the assumption that eventually Mother Nature will work things out and when she does, I’m going to be ready for fall racing! And in the meanwhile, I will try to remember my sunscreen. At the beginning of this week, I was signed up for just two. Run the Bridge 10k and the Philly half marathon (which, by the way, is having a screaming deal TODAY ONLY 12pm-8pm with pricing from way back in April when registration opened. Use coupon codes PM16FULL or PM16HALF). And now I’m up to four! Using the City Fit Girls plan that we used in the winter/spring, my training buddy, Chrissy and I are preparing to tackle all the fall races (or at least the ones I can afford)! We thought it would be cooler by the ocean. We thought wrong. The first run back after not running all that much was exactly what we expected it to be: awful. It wasn’t fun, it was hot, and I’m pretty sure I was dripping sweat all over the boardwalk. That said, I’m so glad that we did it. There’s always going to be that first run back and more than likely, it’s not going to be great. But it’s behind us now and we can move forward! 2016 has been pretty good to me as far as being injury free and I’m pretty stoked about that fact because it’s been awhile since I’ve been able to say that. However, I do have some time goals that I would like to hit and I’m hoping that the fall is when I’m able to accomplish them. What do you have planned for the fall? Any tips for me as I head into the longer runs? A little under an hour from my home, tucked away in the town of Egg Harbor City lies a winery that hold a special in my heart: the historic Renault Winery. Nearly 15 years ago my husband proposed marriage to me in the gourmet restaurant; We hosted our wedding in its banquet hall 13 years ago in May. We’ve been back many times since then for festivals, wine tours, dinners, and brunches. But I’d never been there for a run before! When Chrissy (my long-time friend and running partner in crime) asked if I would be interested in doing the DQ Events Stomp the Grapes 5k at the Renault Winery, my immediate response was YES! Chrissy and I have been on a bit of a training run hiatus for the summer months so I was really looking forward to meet up with her! As an added bonus, the Renault Winery is exactly the same travel distance for each of us, so it made perfect sense. There was day of packet pickup which is always appreciated. We got our cotton t-shirts (originally the description said they were supposed to be tech t-shirts so we were a little disappointed with that change) and our race bibs. We met up nearly an hour before the race began so we were able to take our sweet time and meander around the grounds for a bit. We stared longingly through the gift shop window, which didn’t open until 10am – thankfully we were able to visit after the run! Relaxing on the patio with a fan whirling overhead. It was great to take that hour to just nose around the area and catch up on each other’s lives. We wandered around, chatted with other runners, and eventually found our way to the starting area. This wasn’t the start line but how much fun is Prohibition Alley? The Renault is one of the oldest continuous running wineries in the U.S.A. It was a chipped course but there was no mat at the start so your time began when the clock did. We lined up near the back of the 250 participants and waited for our instructions. We knew that the course was an out and back and it was mainly going to be on a dirt trail. I haven’t participated in any 5ks recently so it was a nice change to get back to a shorter distance, especially in the hot summer months. However, I will say that this course was no joke! The dirt trail was sand, rather than compact dirt, so each step was an effort that seemed to slog on longer than it should. The humidity didn’t help either and while the trees gave us nice shade, the air was soupy. I was a little disappointed because while the run takes place on the Renault Winery grounds, I thought we might be running a bit closer to the vineyards. This course didn’t have much of a winery feel. How can I stomp the grapes if I’m not near any grapes? This was the only portion of the run near the vineyards – right at the very beginning and very end of the course. The volunteers along the course were great and we made friends while we were running with people keeping the same pace as us. We pushed along, walking for little spurts but mostly running and reminding ourselves that it would be over quickly and then we’d be getting our reward of wine! The finishers wine glass with celebratory wine. There was also a meal option for an additional $10 which we opted not to pre-purchase. There were 3 wine choices and both Chrissy and I went with the Pink Lady. It was refreshing after a hot run! And we also got a chance to go back to the gift shop once it opened. For the record, I got Blueberry Champagne, a favorite among the wedding buddies back then and now! You say banana, I say bah-na-na! I’m already counting the days until Chrissy and I start our weekly training runs in Atlantic City again in the fall! I’ve missed this girl like crazy! The fall races I’m registered for are in November: Run the Bridge event and the Philly Half. Who wants to make a bet that I’ll sign up for more in the interim? It’s probably a sure thing. Hey, have we connected via all the social media outlets? Drop a note with your blog, Instagram, Facebook, and Twitter links (click on the words to find us at each!). The Philly Marathon holds a special place in my heart. This race is THE ONE. The one that inspired me to run. In 2010, I cheered Victoria during her first full marathon and that was where I was officially bit by the running bug. In 2011, I ran my first road race, the Rothman 8k, which is part of the weekend’s events with Brooke (and cheered Victoria the next day during the half). 2012 was a year of volunteering – I gave out heat wraps and medals – giving back to the running community that has provided me with so much. 2013 was a year of cheering Kyle at HER first marathon. Are you sensing a theme here? And finally, in 2014, I ran the half, while Victoria ran the full. This year I once again registered nice and early for the half. As the date drew closer I asked my dear friend, Chrissy, if she had any interest in joining me. Chrissy is newer to the running game and we had a lot of fun at the Broad Street 10 Miler in May. She and I have been friends since 3 grade and I always have a blast with her. After talking her into it (not difficult, for the record) we were ready to embrace the race! The most important thing, besides the running, was what we were going to wear. Since we are from the Northeast and since we love coffee, hot chocolate, donuts, bagels, and everything else Dunkin’ Donuts has to offer… we settled on this! Flat us, practicing holding hands. We woke up bright and early on race day and made our way to… Dunkin’ Donuts. Because, you know, priorities. Got the train to Philly and walked the mile or so to the start area. The goal was to meet up with Bonnie pre-race to give high fives, hugs, and pep talks. But that’s not exactly how it played out. There were security lines that seemed to go on for blocks, serpentine-ing around streets and buildings. Since the Boston Marathon tragedy occurred, they’ve added security check points at the Philly Marathon. I sincerely appreciate and completely understand the efforts. However, this was like nothing I’d seen before. I know recent events had an effect on this but there was a lack of communication, volunteers, and general knowledge for the runners waiting in line. Additionally a lot of people who were cheering were in this line and I think that made the quantity of people more than the checkers could handle swiftly. We waited on the line for an hour, without seeing much movement. Once the clock struck 7am (the time the race was supposed to start), all of a sudden we moved at a fast pace, streaming through the gates. The first racers were off at 7:13. That said, that was the only snafu that we encountered that day. Everything can’t be perfect, right? We still made it into the blue corral with plenty of time to spare. Sometimes being in the last corral has its benefits! We danced our way up to the start line, jamming to songs like the Percolator and Murder She Wrote over the sound system. Kicking it old school! Soon we crossed the start line and took off to the sounds of the Rocky theme. Obviously! We heard that often throughout the 13.1 miles and I pumped my arms over my head each time. I think one of the (many) reasons I adore running in Philly because I know where we are at all times. It’s my own personal tour of Philly, via foot! We passed the church my friends recently got married in and then a bit later on, the Moshulu, where their reception was held. In October, Jay and I drove from point A to point B. Not so much on Sunday! Chrissy and I were doing 1:1 intervals and keeping our eyes peeled for fun things. Like all the Dunkin’ Donuts along the course. I’m pretty sure we saw at least 6! Instagram friend and fellow blue buddy Rachel found us and we got to see her several times throughout the race, which was awesome. And she did. Because it felt like it was never ever going to end. Once we finally got passed it, we resumed our 1:1 intervals throughout Fairmount Park. I listened to an awesome pep talk that someone else was getting from their personal cheer squad. I decided that I too, needed a pep talk, which I voiced. An awesome man on the course did just that. You can always rely on fellow runners to pick you up! After the rough uphill a bit early, there was a glorious, glorious downhill. Hurrah! At the bottom of the downhill was a cheer group that I was very much looking forward to. Turn up your speakers and get ready to boogie! Are they not freaking awesome? From there, we knew we only had a few miles left. Our goal was to finish under 3 hours and we knew if we stay consistent with our intervals, we would achieve it! I focused on my breathing and listening for the beep of Chrissy’s watch. We didn’t talk much the last couple of miles, we just wanted to get to this point. Jokers to the left, clowns to the right? Once we got passed that sign and saw the front of the Art Museum, it was go time. We started to pick up speed and crossed the finish line, hand in hand! And then we got medaled. Which was when all the emotions hit. And there might have been a few happy tears shed between the two of us. We did it! Furthermore, we did it together and felt really accomplished about the entire experience. Chrissy has told me a few times that I’m one of the reasons that she started running and I can’t even begin to tell you how special that makes me feel. I know what running does for me and to have her be able to experience that and feel so positive, it’s truly a blessing to be part of her journey. This medal is the BEST. It rings! We found Rachel again while waiting for the finish line snacks and goodies and it was great to be able to catch up with her and learn of her 32 minute PR. Freaking awesome! As was the warm chicken broth and rice that they give at the end of the line of goodies. I told the volunteers how excited I was for it and they seemed surprised. No way, man! The salt and the warmth is perfection. Momentum Jewelry helped me keep my CAN DO attitude! On the train Chrissy and I took our banana phone picture, as is standard practice here! We also rang our medals incessantly. I’m sure the other passengers loved us. No shame! Once the Philadelphia Marathon weekend is complete, I feel like it’s the official start of Thanksgiving and holiday time. So, come at me, sides! My body is ready! The Scoot a Doot Chicks hope you all have a very happy, healthy, and safe Thanksgiving! We’ll see you back around these parts on Friday.